Home / Le blog / The Swamp from Poitou in paint! The Swamp from Poitou in paint! 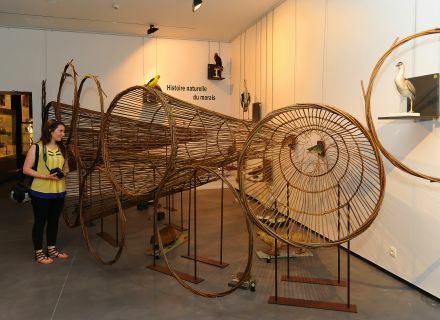 During my visit to the museum Bernard d'Agesci, I discovered a beautiful way of learning it more on the Swamp from Poitou thanks to the temporary exhibition which dedicated to him the museum of Niort for his ten years of opening. 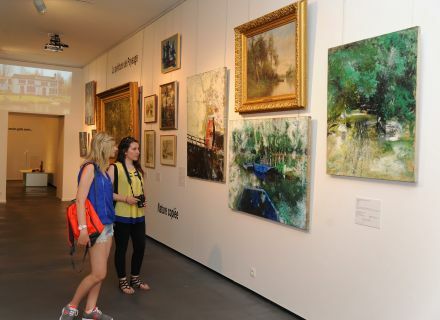 We can admire there sublime and remarkable paints of landscapes representing the Swamp from Poitou. 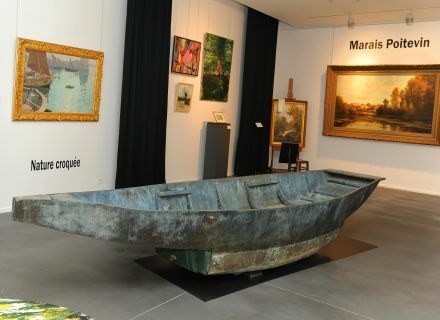 When I am gone into the first room, we notice at once the impressive metal boat of Buraglio put in the center of the room and surrounded by big paintings of XIXth and XXth centuries, all so different some as the others, but redrawing the wet and natural landscapes of the Swamp from Poitou. Every room abounds in small secrets. To you to discover them! Period costumes, domestic objects, tales and legends … You know all the slightest details of the Swamp from Poitou of the XIXth century. 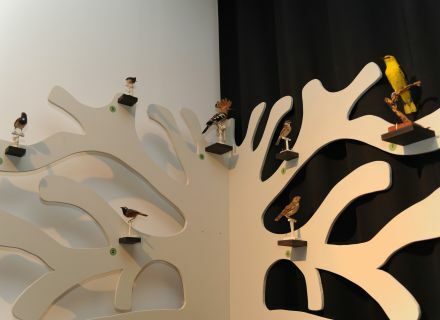 By continuing my visit of room in room, here I am maintaining inside a room dedicated to the fauna “ maraîchine ”. We discover it a magnificent wicker creation made by Myriam Roux. So, I was able to contemplate all the small human beings symbolic as the famous otter of Europe, the heron or still Rosalie des Alpes, a small rather rare and protected insect. We also see there a magnificent small white tree on which are represented the various species of birds which we can find in the wet swamp. (*) it is about " Mother Martin ", a recently restored portrait. This painting of the niortaise Suzanne Baudia represents an inhabitant of Saint-Liguaire carrying a headgear of mourning “ maraîchine ” and the associated casaquin, the single-breasted jacket of grey, characteristic color of the daily dresses carried by 1890. A journey in the time above suspicion and to fail on no account! The entrance to the museum Bernard d' Agesci is 4 € and it is free for people under 25. Know that you can find the temporary exhibition " Of the Red Arm in the Green Venice, Swamp from Poitou, the stories of waters " until next January 6th to the museum Bernard d' Agesci, from Tuesday till Friday from 10 am till 1 pm and from 2 pm till 6 pm, on Thursday from 10 am till 8 pm, a Saturday and Sunday from 2 pm till 7 pm. Closed on Mondays. 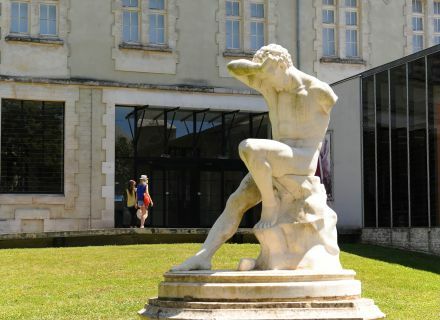 The Pass Heritage allows you to reach preferential rate in four remarkable patrimonial sites of the territory of which the Bernard d' Agesci museum. You can buy 1 € the Pass Heritage in the various points of reception of the Tourist Office. You will benefit then from a reduction from the first visited site. Photo credits: Mother Martin (museums of the CAN) and the other (OTNMP).